This tutorial shows how to create gauge-like graphics like the one shown on the bottom of this page. Create a blank image with black background of size 130x100 pixels. create an additional layer, name it something like center. mark the center of your gauge with a cross or something. will not be seen in the resulting image. My center will be at 65,60. It is not exactly in the vertical center, but the gauge will not have a 360� display, so it perfectly fine to move the center of the gauge out of the center of the image. Create a new blank layer and name that something like "lines". Use the "Select elliptical regions" tool to create a circle with radius 50 around your center. After you have done that, invert the selection. 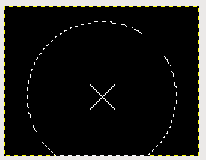 This enables you to draw lines from a radius of 55 to the center but only showing the outer 5 pixels. draw the continous line between the 0% and 10% mark along the selection. Fill the area between 90% and 100% with a pure red color. Dont care about the arc on the outer side of the area, that will be done next. Shrink the selection by 10 pixel and disable the shrink from border checkbox. Invert the selection and draw the outside of the red area. Use "Script-Fu"->"Alpha To Logo"->"Glowing Hot"
Effect Size 20 pixel, black background. Remove the new background layer and move the line layer to to top. Hide the layer with the cross and save as a png image. Save it as gimp native, too. you might need that again. To have the gauge show something, a pointer is needed. This pointer will be created by a C program. The howto for this program will be in the C-Programming section soon.